When Will I Get My 9x12 Envelopes? 5,000 and under 9x12 Envelopes: Ships or ready for pick up in 2 business days from proof approval. Choose printed 9x12 envelopes from 48HourPrint.com and give your larger-size mailings a polished professional look -- immediately. And you can be confident that our high quality 9x12 envelope printing gives you more for your money. 48HourPrint.com online envelope printing services are very affordable, convenient to use, and big on value. Printed 9x12 envelopes are real workhorses in delivering letter-size materials. Use 9x12 envelope printing with your full-color logo, tagline and return address to command attention and respect. These 9x12 envelopes allow you to send materials without folding and they fit easily inside our printed 10x13 envelopes as return envelopes. In addition to 9x12 envelope printing, our online envelope printing services include #10 envelopes, #10 window envelopes, #9 envelopes, A2 envelopes, A6 envelopes,A7 envelopes, A9 envelopes, and 10x13 envelopes. 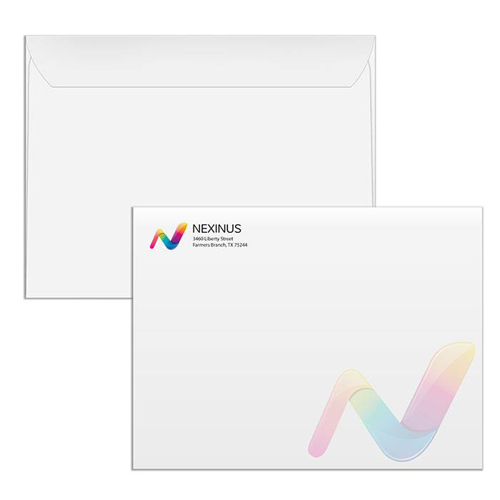 Our 9x12 printed envelopes are full color one side and are printed on laser and inkjet printer-compatible paper stock.